Don’t sweat the small stuff. I have heard this saying over and over throughout my life. It always made a kind of sense to me, but had never become real to me until I stitched it together with the next two “Rules” . Not sweating the small stuff could be taken as a polar opposite to what constitutes craftsmanship. The taking of the time and the effort to “sweat the details”. This is NOT how I choose to use the phrase here. I insist that a craftsman deliver their own, best effort, at all times and in all their projects. No corner cutting. Rather, by embracing rule 1, it sets the stage for a woodworker to free themselves from fear. What I mean here is that in woodworking, and in life too for that matter, Fear is often times the major stumbling block to those good and satisfying things we wish to have in our lives. Fear is a barrier to attaining what we want in our heart, to accomplish. Fear of failing, fear of embarrassment, fear of not measuring up to our peers. There seems to be no end to the number of things that we as people, let alone craftspersons, can convince ourselves to be afraid of. By adopting a philosophy of “not sweating the small stuff”, we open ourselves to possibility. Sure, all those things we convince ourselves to be afraid of don’t just go away. The chance that we might fail or be embarrassed surely do exist and may indeed come to pass. The difference is, if we adhere to these three rules, and do so with genuine and honest effort, we can reach a place of Madcap Nirvana. That is to say, we just don’t care if we fail, we just don’t care if we do something embarrassing. We embrace the failure, we embrace the embarrassment. A key element of Madcap Nirvana is redefining failure or embarrassment or other negative, fear driven outcome, as an outcome other than what we initially had hoped for. In embracing the possibility of outcomes other than what we initially had hoped for, we open ourselves to what is, rather than what should be. Taking this a step further, it is in the acceptance and willingness to embrace what is, over what should be, that we can find avenues of creativity and discovery that would otherwise have been unavailable to us were we to remain fixed in the focus of what should be. Learning to operate in acceptance of what is creates an environment that allows the artisan savor each moment in the creative process fearlessly. It’s all small stuff, and I can prove it…If you woke this morning, were able to open your eyes, see the dawn, wiggle your toes, stretch, feel the sun on your face, smell the lilac, walk to the kitchen and make fresh coffee… those things, are BIG STUFF. Everything, and I want to emphasize this, EVERYTHING else is small stuff. The rest of your day is icing on the cake. Just realizing that having the ability to do those things I mentioned above, is reason enough to take the rest of the day as something to be grateful for, enjoy, and hypothetically would make the rest of the day something of a vacation day. That is in spite of having to go to a job we dislike, or having to interact with people that leave us with a bitter taste in our mouth. We are ALIVE, and…and this is another big one… we are alive and have the ability to go out to our shop and make shavings or make sawdust. What an amazing gift that is! So if those dovetail joints don’t fit just right, or that board is not as square as you had hoped it would be….so what? So what if it looks like a failure? It’s a demonstration of effort. It is a celebration of our ability to take advantage of having opposable thumbs. It’s an example of a creative soul attempting something different. That alone makes the attempt worthy and worth doing. Everything else, just as in the example above, is gravy. This rule sounds almost flippant, or as something said as a joke or tag line, but is actually the most important rule of the three. I try every day to remember not to sweat the small stuff. I try every day to remember that it is ALL small stuff. Am I successful? Sometimes yes…and…sometimes no…and that’s just fine. Sometimes I forget that it is amazing that I woke up in the morning. Sometimes I forget to wiggle my toes. Sometimes I forget that each day is remarkable simply because I am alive to experience it. It’s natural. It is part of the human experience to live some days with less than monastic meditation and gratitude each and every moment. However, on those days when I remember rules 1 and 2, I find that I enjoy, even the smallest victory, more vividly. I find that things seem to flow more smoothly. In those times when the inevitable mistakes are made, I try to remember to embrace them, and look for the lesson in them. Or look for the discovery in them. Or look for the creative method to manage, or even fix the mistake. If i’m faithful in this, I nearly always find what I am looking for. Remembering these rules has absolutely changed the way I experience the world. I would be willing to wager that it may be a game changer for others as well. I would say this though, take the three rules and make them uniquely your own. Don’t take my word for it. It is through the prism of an individual’s experience that these rules should be applied. Apply them to your own experience in a way that makes the “rules” yours. I submit them as an example of my own experience, and fodder for contemplation and consideration, not as gospel. It would be presumptuous of me to make the assumption that these three rules are universally applicable. They may very well not be. They are truth in my own experience of life, and it is my hope that they are in someone else’s as well. 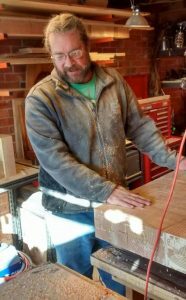 John McBride is a professional woodwright, blogger, and writer, living and working joyfully and with abandon in Denver, Colorado.